Machine Learning: How Close Are We To Something Like I, Robot? Will Smith might have been onto something when he chose to star in movie about intelligent robots taking over the world. Will Smith might have been onto something when he chose to star in a movie about intelligent robots taking over the world. I, Robot featured Mr. Smith’s character battling intelligent robots both in the physical sense and the intellectual as he struggled to reason with and fight the calmly invading forces claiming to strip mankind of its free will on order to save us all from ourselves. It’s a case of machine learning gone bad. It also represents a primal fear we humans seem to have of losing control thanks to machines which eventually become "too intelligent". Perhaps it’s because of the universal nature of this fear that artificially intelligent robots have been the subject of a sizable collection of science fiction literature and film. The notion of machines thinking for themselves taps into a classic theme in Science Fiction that’s been covered several times over. 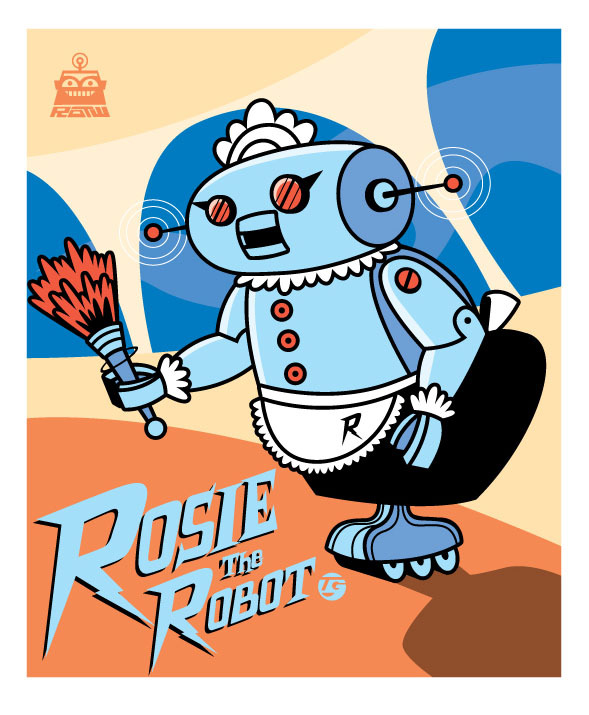 Remember "Rosie" from The Jetsons? Many of us grew up with weekly Saturday infusions of AI in action, as the personal maid to the Jetson family wheeled around giving taut replies along with her household service. And how about "Ash" from the Alien movies- his artificial intelligence was so advanced we didn’t even know he was a robot until near the end of the whole thing. But with the advanced state of Artificial Intelligence today, can we even call these ideas science fiction any longer? When Real Science Catches Up To Science Fiction, Things Get Pretty Wild. Machine learning has recently leapfrogged from a sparse offering of quaint prototypes to incredibly impressive technology that’s in use all around us (you’ve heard of Siri...). The accelerated pace at which machine learning is advancing right now is apparently something which was unimaginable even ten or fifteen years ago. We may not yet have robotic personal assistants or armies of robots to serve us in other capacities, but we are coming pretty darn close. Right now the U.S. Navy, in conjunction with University scientists from several top institutions, is testing out robots who fight fires on ships. Designed to peer through smoke, keep their balance in rough seas and aim water hoses at flames, these robotic first responders are eerily similar to what Will Smith’s character dealt with in I, Robot. They may not look the same, but they sure do behave a lot like the servile white armies from the movie. Although actually having robots put out fires for the U.S. navy is still a few years away, there are plenty of examples of machine learning in action right now. But before we got here, let’s make sure we’re all on the same page as far as what machine learning actually means. The whole concept of machine learning might seem a little overwhelming and dense at first, but here’s a quick primer for understanding the basics. Computers are glorified calculators...at least as far as most of us understand. They do exactly what their input (programs) tell them to do, and no more. Machine learning, on the other hand, is when a computer takes in data and spits out something more than a calculation: a prediction (and someday, an opinion). How does this work? To get a computer to make a prediction, you have to feed it lots and lots of examples so it can recognize patterns. No surprise then that patterns recognition is what makes living creature – and so human – opinionated, passionate, intelligent. The more data you can give it, the better it will become at seeing these patterns. The recognition of patterns is the beginning of Artificial Intelligence since it allows a computer to eventually give you a prediction about something it’s never seen in an example of before. And what can we do with pattern-based predictions? The medical community is already using machine learning to work on predictive tests of Alzheimers, cancer, diabetes and more. Google’s Prediction API is helping online business people make sense of the overwhelming stats from their Pay Per Click campaigns. What’s Up With The Blistering Pace Of Machine Learning Development? One reason we’re seeing such a flurry of activity from the scientific community in this area is because of the revival of an area of computing once relegated to the back burner for lack of support and interest. Called deep learning, it mimics the physical makeup of the human brain. A thousand networked computers work like the similarly interconnected neurones in your brain. Together, they posses a unified computing power called a neural network. Deep learning was first brought about by scientists in the 1980s, but computers back then simply weren’t powerful or fast enough to get through enough data in order to start recognizing any patterns. Besides, there wasn’t even much digital data to feed computers! Now, that’s all changed. Facebook and Google alone have amassed so much data they’re able to effectively feed deep learning machines enough of it to get some results. That’s what’s driving the new look at deep learning and the recent wave of exciting developments in machine learning. Machine Learning Is In Your Life Right Now. Most of the practical applications of machine learning in use right now involve language recognition technology. This can be applied to emails and social media, which is where you’ve probably already experienced what it can do. If you use Facebook, you’ve already come into contact (albeit indirect) with machine learning. The folks over at Facebook are already using machine learning to actively filter what shows up in your newsfeed. And if you’ve ever used Google’s translation feature on a website, then you’ve seen machine learning in action. There’s nifty software being written and used in email apps which could prove incredibly useful. By recognizing patterns in the contents of your email, the software can help you categorise your inbox...sorting out the messages that require a response from those which are "for your information" only, for example. You’ll probably soon be seeing tons of ways machine learning is combined with language recognition technology to produce useful aids for modern living. Before you know it, machine learning will be given a voice...move over Rosie the robot maid and make room for the descendants of Siri, who will arrive to clean-up and sort out our digital and online lives. We won’t be finding ourselves in the shoes of Will Smith’s I, Robot character anytime soon, but we sure are a heck of a lot closer than anyone could have imagined. Why So Many Small Businesses Are Paying For Facebook Ads? Are we all working for the Robots? The Year Tech was … Boring … is this it? Google Penalties: Is Getting a Pardon Possible?